Hosting a buffet dinner party is a great way to have an informal get together with your family, friends or coworkers. When planning your next buffet dinner party, choose elegant yet simple menu recipes, set up your table for convenience and visual appeal and strictly adhere to buffet food safety guidelines. Choose an overall menu theme, such as Indian, Italian or Chinese. Choose themed salad, appetizer, main dish and dessert recipes that have several contrasting colors to create visual appeal. 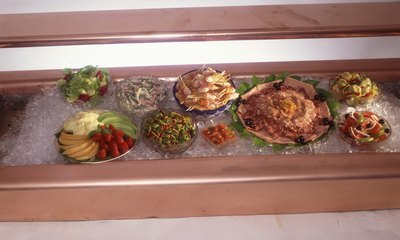 Select several theme-inspired finger foods and dips as well as premixed salads that can be served in small cups and main dishes with bite-sized meats and vegetables. Choose desserts based upon your guests' dietary restrictions. Pick a few local, in-season fruits and vegetables for raw food trays. Place your main buffet table in the middle of your party room so your guests will have access to both sides. This table will include your salads, appetizers and main dishes. Position your beverage table far away from the main buffet table to ensure that guests with plates of food do not bump into guests with beverages repeatedly. Creatively place your desserts on a small table, counter or shelf so the arrangement can double as a party decoration. 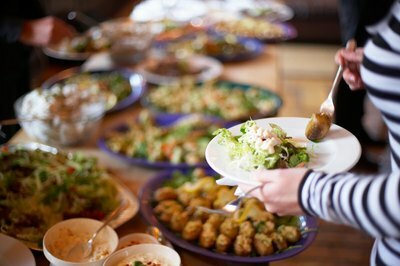 Place your main buffet table foods in groups of plates, main dishes, sides and vegetables, salads, appetizers and finger foods. Position napkins and rolled silverware at the end of the food display so that your guests will have their hands free to serve themselves. Keep hot foods warm in chafing dishes and cold foods over dishes filled with ice. Add height to make your dishes easily accessible and to decorate your buffet table. Cover sturdy objects with tablecloths or fabric samples and place your most attractive dishes above them. Overfill your serving dishes so your guests will not feel obligated to take less than what will fill them up. Refill your serving dishes frequently, if possible. Wash your hands before, during and after your food preparation. Keep all of your utensils, pots, pans and dishes clean. Keep cold food in the refrigerator and hot food in the oven until serving time. Replace empty food platters with clean and filled food platters to avoid spreading hand germs. Remove and discard food that has been sitting on an outside buffet table for over 1 hour and an inside buffet table for over 2 hours.